Jelenleg az egyik legjobb és legnépszerűbb elektromos kávédaráló! Rendelhető fehér és fekete színben egyaránt. Mythos One is one of the most advanced espresso grinders you can find, produced by Victoria Arduino from Italy. Created by and for professionals - it can be found in the most demanding cafes in the world and on the tables during the World Barista Championships. - On Demand - grind as much coffee as you need, directly into the portafilter. - Durable Burrs - 75mm diamater, made of steel, covered with titanium. - Clima Pro Technology - the innovative, intelligent management of milling chamber temperature (35 to 45 degrees Celsius) that ensures constant dose and therefore a better quality of espresso extraction. - Precise and Reliable - with the clump crusher system the dose is dropped into the center of the portafilter with less than a gram of grounds retained between doses, reducing the need to purge between dose and waste beans. 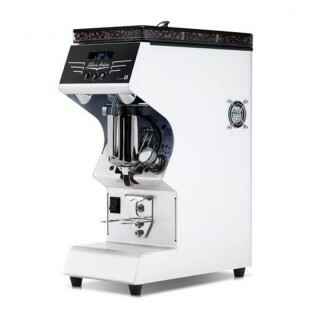 - Micrometric Grind Adjustment - allows for infinite and stepless control of grind coarseness. - Quiteness - total silence is mark of its superb technology, which is the result of using the highest quality materials along with excellent construction precision. - Programming - program the dose or use the Barista Mode, which allows for dose adjustments of all free individual dose buttons, without having to enter the programming mode. - High Production - it grinds more than 15 kg of coffee an hour. The hopper may hold up to 1.3kg of beans. - Portafilter Hook - hands-free grinding increases efficency of the bar. - LED Lamps - Illuminated workspace.